A Product Collection Form allows you as the business owner to add more than one specific products in a single payment form. 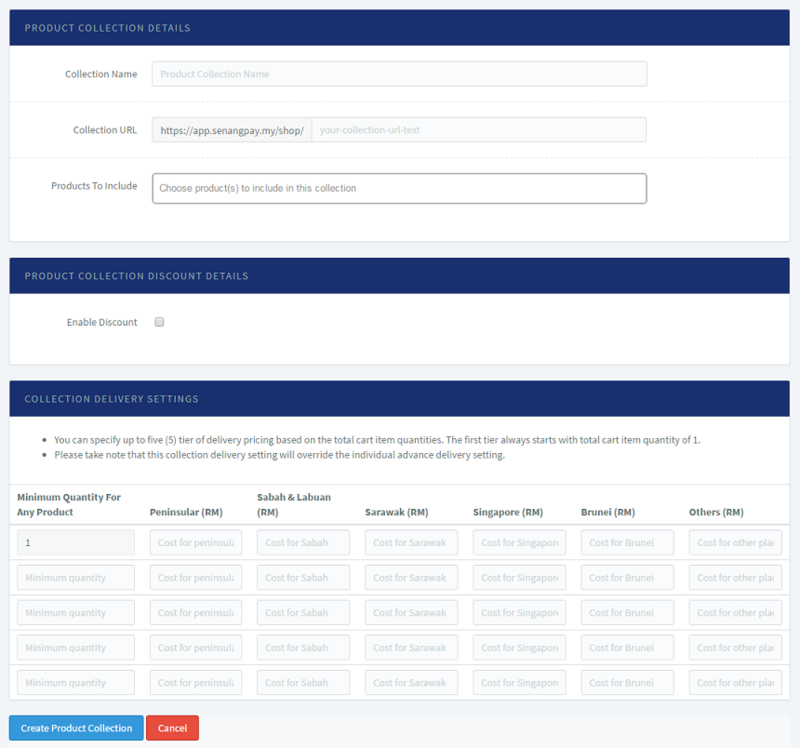 This form allows you to sell a maximum of 10 products in a single form. Instead of having 10 Unique Payment Form to sell 10 items, you can have 1 Product Collection Form to sell 10 items. 1. To view an example of Product Collection Form, please click here. 1. The Product Collection Form is available for all packages. Please take note that before you create your Product Collection Form, you need to create your Unique Payment Form for each of your product. Then, add all of this product (maximum of 10) into your Product Collection Form. 2. Insert your Product Collection Details such as Collection Name, Collection URL and Products To Include. 3. At “Product To Include” section, insert products to be listed in product collection. The products need to be created at first place before you create product collection. You can set the discount for the product collection. Discount amount can be set based on your preferred minimum total cart quantity and amount. 2. Tick the checkbox to display discount in the form. Leave the checkbox empty to hide the discount. 1. You can specify up to five (5) tier of delivery pricing based on the total cart item quantities. 2. The collection delivery settings is to specify exact delivery price based on location and quantity of a products in the cart. The delivery cost is based on the minimum quantity of the products set in the settings. 3. Insert the cost accordingly. 4. When you have finished, click “Create Product Collection”. 5. Your product collection is now in the system. 6. Go to “Product Collection” and click “List” to view the product collection payment from created. 7. The product collection forms created will appear in the list. 8. Click on name of product collection to view further details. Click on “Edit Product Collection” to edit the product collection. 9. Once you confirm, click “Save Product Collection”. 1. What is Product Collection Form is. 2. How to optimized the use of senangPay payment forms.